If you’re looking to upgrade the furniture in your children’s bedroom as they grow, the best cheap bunk beds can save you both space and money! You don’t have to spend a lot to get a high quality bunk bed for your children and their friends to enjoy. We found several great options for parents looking to save some serious dough! Before we get into our bunk bed review, here are a few key features you should know about first. Material: The bunk beds we reviewed were made of either wood or metal, and both have their advantages. Wooden beds are sturdy and look far more expensive than they really are, while metal beds are lightweight and easy to move around. Access: Some beds allow children to access the top bunk by stairs, while some use ladders. Stairs are easier for small children to navigate but take up more space. Ladders save space but may be tough for little kids to use. Size: The size mattress you need depends on the room space and the size of your children. We found beds that use twin, full, and even queen-sized mattresses! There are even options that use combination sizes to give you more flexibility! Finish: We were lucky to find cheap bunk beds that come in a wide variety of colors and finishes, from bright white to glossy black. You can easily choose a color or finish to perfectly match your child’s current room décor! Dimensions: To help you plan out your child’s bedroom, we also let you know the dimensions of each bed so you can measure your space before buying. This is especially important if you’re working with a small space or low ceiling! Warranty: Just because you’re looking to save some money on a bunk bed doesn’t mean you shouldn’t feel confident about your purchase! A warranty is a good sign that your bunk bed may be replaced or repaired if something goes wrong! Now that you know about the great features available, let’s get into the reviews! We researched several beds to find you the best bunk bed for your child’s room! Whether you need a compact, simple bed or want to invest in a sturdy piece that’ll grow with your family, we found great options for everyone! Start by checking out our Top Pick and Budget Pick, and you can always come back later to read about the rest. Let’s get started! 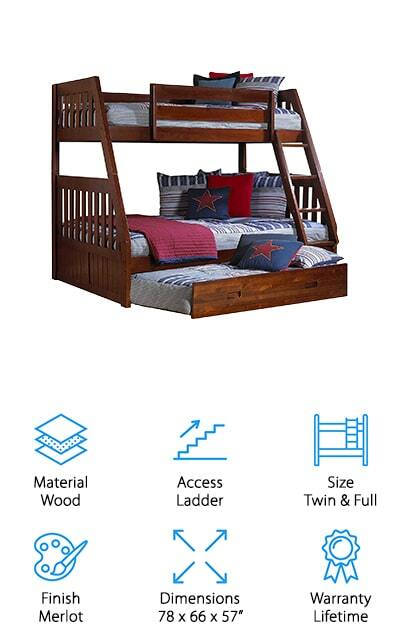 Our Top Pick for the best cheap bunk beds goes to this beautiful wooden bunk bed set from Dorel Living! This set is made of durable, solid wood that comes in a variety of finishes: grey, black, espresso, white, and graphite blue. You can easily find one that fits in with your décor and will look great for years to come! We also like that this bunk bed has a twin mattress on top and a full mattress on the bottom. This is great, especially if you have an older child who needs a little more wiggle room! The beds also detach, so you can use them as separate beds as your children grow, or if you decide to put them in separate rooms later on. We like this because it will save you even more money over time. Instead of buying all new beds once your children get separate rooms, just split up the beds and you’re all set! If you are looking to save both space and money, our Budget Pick from DHP will definitely do both! 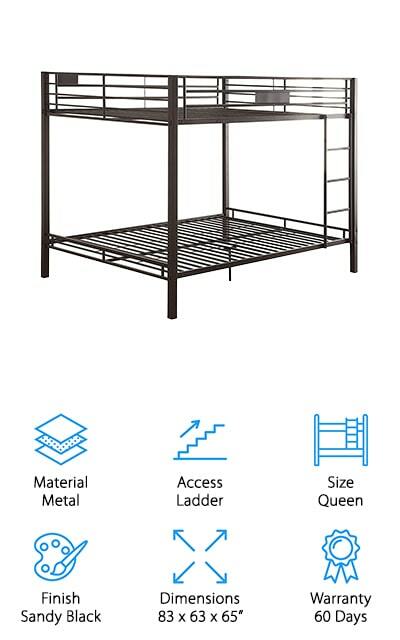 This metal frame bunk bed comes in 4 bright colors: black, silver, blue, and pink. The simple design is made to save precious space and the lightweight metal frame is easy to assemble and move around the room. 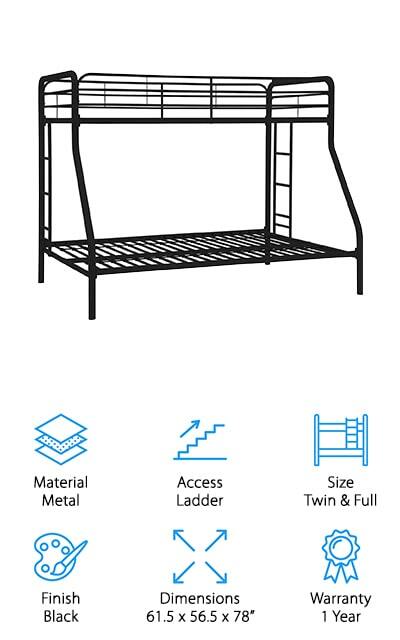 We also like that there are built-in ladders on both ends of the bed, so you can position this anywhere and still have easy access to the top bunk! The top frame is for a twin-sized mattress, and has side guards to keep your child safe while they roll around in bed. The bottom bunk is for a full-size mattress, and it’s perfect for an older child who needs more room to get comfortable. We think this is a great inexpensive option for parents who don’t want to spend a lot on a bed their children will outgrow in a few year’s time! Next up is this sturdy bunk bed from Storkcraft that’s perfect for rough and tumble kids. The frame is made of rubberwood, which is dense and durable wood that can withstand lots of climbing and years of heavy use. We like that the ladder is at an angle, making it easier for small children to handle. The guardrails on the top add extra safety, preventing your child from rolling out of bed. The solid hardwood frame also comes in 4 non-toxic, neutral finishes to match your bedroom décor: gray, espresso, navy, and white. 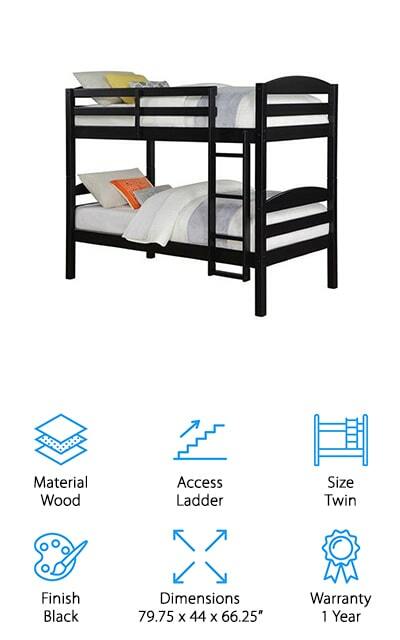 We also like that this bunk bed can break down into two twin-sized beds, which is perfect for parents who want to split their children into separate rooms as they grow older. No need to buy all new beds, which saves even more money! We think this is a great set for young children who are rough on furniture because it will stay strong for years! 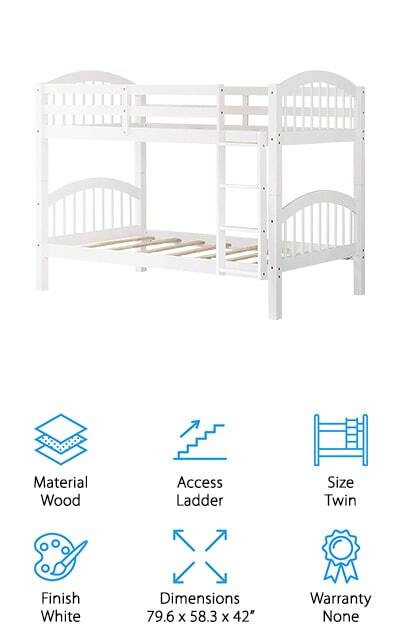 Need a bunk bed for a large family that can accommodate up to 3 kids at once? 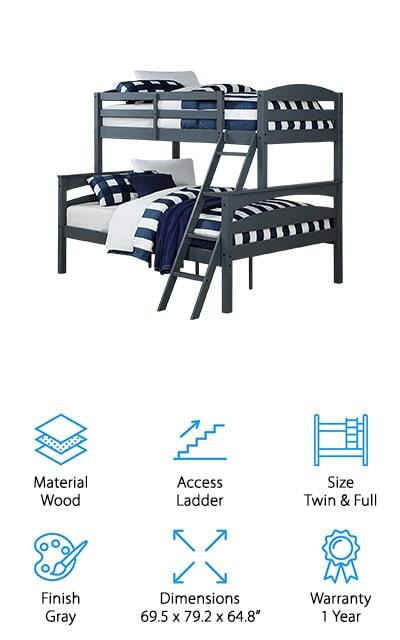 Here’s a great triple bunk bed option from Dorel Living! 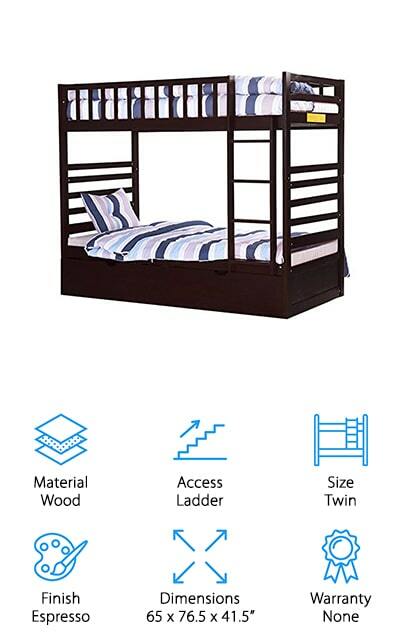 This bunk bed is perfect for a large family that needs to save precious space and money! 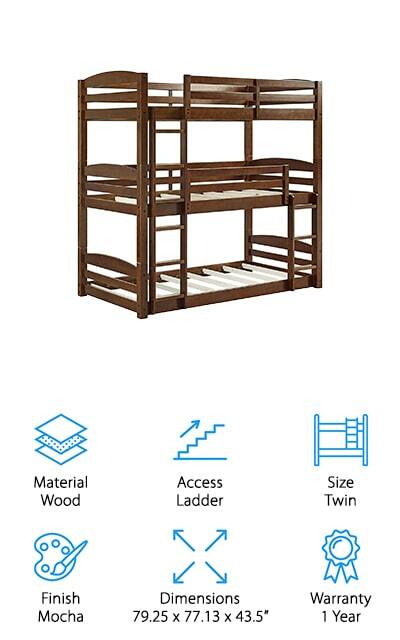 The solid wood frame holds 3 twin-sized mattresses and has 2 ladders to easily access the top 2 levels safely. The top 2 levels have side rails for added safety, while the bottom bunk is on the floor level – perfect for your youngest child! You can also break this bunk bed apart into a bunk bed and daybed, or split it into 3 separate beds for when your children get older. That way, you don’t have to buy new beds for your kids as they age and want their own rooms! We think this is a great option for parents who want low bunk beds that can handle their rapidly growing family without breaking the bank! If your children often have friends sleep over, a trundle bed is a great idea to give their friends a comfy place to sleep that won’t take up extra space after they’ve gone home. This bed from Discovery World has a twin-sized top bunk, full-sized bottom bunk, and extra twin-sized trundle bed on the bottom! Now you can let friends stay over without making them sleep on the couch or in sleeping bags! If you don’t need a trundle bed, the slide-out frame also doubles as storage for toys, books, and clothing! The beds also break apart into separate beds, and you can configure the headboards and footboards however you like too! We like that this bunk bed has a classic look in 3 wood finishes that will coordinate with your child’s décor perfectly. There’s a bright Honey finish that looks like knotted pine, a deep Merlot that resembles cherry, and a dark Espresso that matches well with mahogany furniture. Another great option for a bunk bed with a trundle is this beautiful and compact set from Merax! This bunk bed accommodates 3 twin mattresses comfortably, with a sleek design that’s made to save precious space in your child’s room. The ladder is built into the frame and doesn’t stick out, which is great for small spaces. It’s made of solid pine, which is durable, splinter-free, and made to last for years while still looking good. The trundle drawer easily fits a twin-sized mattress up to 6 inches thick, so your child’s friends can have a cozy place to sleep when they spend the night! No more sleeping on the floor in sleeping bags! You can also easily add bins or boxes into the drawer instead of a mattress to provide extra storage for toys, seasonal clothing, or extra blankets for chilly nights. The rich brown finish will look great with any décor in either a boy or girl’s bedroom! If you’re a big fan of Craftsman style furniture, this sturdy bunk bed from Mainstays will fit in beautifully with the overall look of your furniture throughout your home! This twin-sized bunk bed is made of solid wood, with a simple design that won’t ever go out of style. It comes in 6 different colors and finishes to suit your personal taste: black, gray, white, cherry, pine, and mocha. You should have no problem finding a match for your child’s décor or their other bedroom furniture! We like that the design of this bed is simple and sleek, saving you precious floor space for more playtime and fun! The ladder starts off the floor, which means you could easily store boxes, bins, or even an extra mattress under the bed for when friends come over! We also like that this bed breaks down into separate twin beds, so you can put your children in separate bedrooms when they get older! Looking for a bunk bed that’s easy to set up and tear down at a moment’s notice? 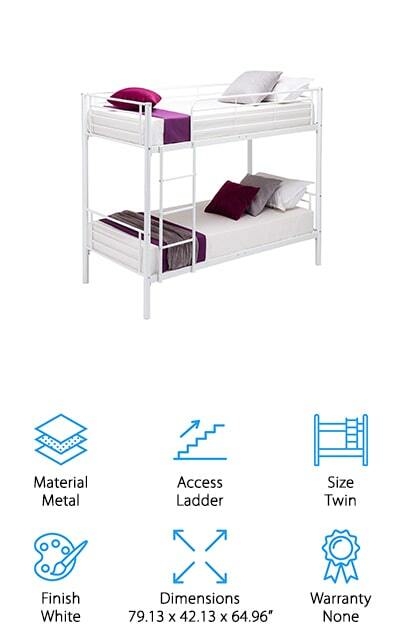 Consider one of these metal bunk beds from Mecor that are incredibly easy to put together! The twin-sized beds are sturdy and capable of holding children or adults safely! They are made to use as little space as possible, and you can move the ladder to whichever side of the bed is best for your room’s arrangement. The ladder also has an anti-skid coating to prevent slipping while going up or down the ladder. We like that this bed is easy to set up, so you can get it up and ready for bed without a lot of hassle! Since it is so easy to set up, we think this would be a great bed to keep around for when family or friends come over to stay! It also comes in black, silver, and white to give you plenty of style options! As your children grow, it’s perfectly natural to think that they will want more space to move around when they sleep. 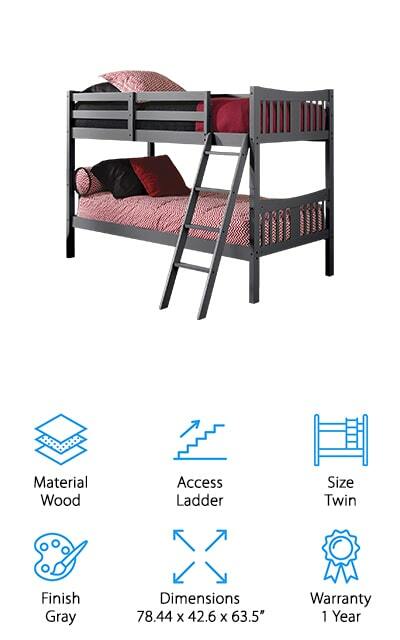 This queen-sized bunk bed is a great option for kids, teens, and young adults to get a great night’s sleep no matter their size! The metal frame is lightweight and easy to set up, yet durable enough to handle two grown adults sleeping on it. The full-length guardrails on all sides keep your child safe while sleeping on the top bunk. We also like that you can move the ladder to whichever side of the bed you prefer, which is great for smaller rooms and awkward spaces! We think this is a great option if you have teens that still need to share a room, or for giving your kids more room to move around. It also makes a great bed to keep on hand for when you have a lot of family or guests come over to visit! Last up is an adorable wooden twin over twin bunk bed from Harper & Bright Designs that’s perfect for your little ones! This wooden bed comes in white, walnut, or espresso finishes to suit your home décor or current furniture. We also like the simple design, which will still look stylish as your children grow. This is a great bed if you’re looking for low bunk beds for small children. The guardrails on the top bunk are high and keep your child safe, while the ladder is easy to get up and down safely. You can also split these into two separate beds, which is great when they grow older. If one of your children isn’t ready for bunk beds, that’s okay! Just split them into two beds, and leave the guardrails on while your child gets used to their “big kid” bed. Once they’re ready, you can easily bunk the beds to give them more floor space to play!